Washington, DC – May 10, 2012 – The U.S. District Court for the District of Columbia has rejected an attempt by the Interior Department’s Bureau of Land Management (BLM) to withhold and ignore critical scientific evidence in its decision-making process for the implementation of a precedent-setting plan to castrate wild stallions. 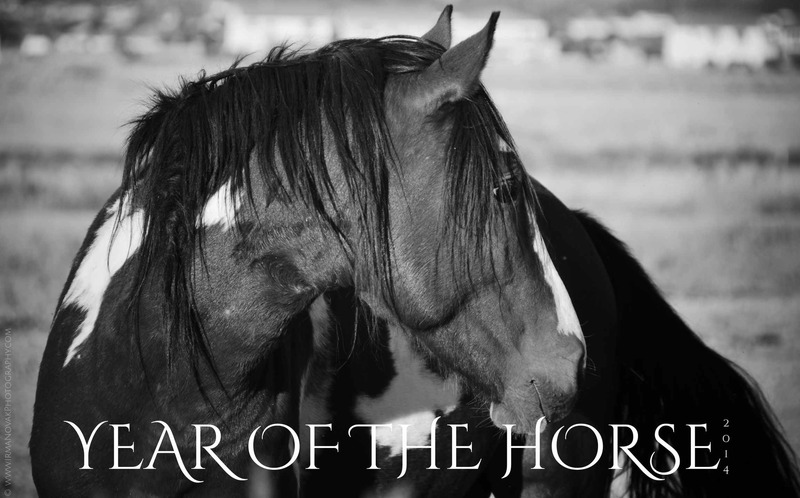 At issue were expert declarations submitted to the BLM from leading experts in wild horse behavior and biology outlining the devastating impacts of castration on the health and natural behaviors of wild free-roaming stallions and wild horse herds. The ruling is part of litigation filed in December 2011 by the American Wild Horse Preservation Campaign (AWHPC),Western Watersheds Project and The Cloud Foundation challenging the BLM’s illegal plan to castrate hundreds of wild stallions in eastern Nevada’s Pancake Complex, as well as to eliminate wild horses from the Jake’s Wash Herd Management Area, which lies within the Complex. The ruling on this case will have widespread implication for thousands of the remaining wild horses living free and wild on public lands. The Honorable U.S. District Judge Beryl A. Howell stated in her 23-page opinion that the agency “may not simply remainstudiously ignorant of material scientific evidence well known to the agency and brought directly to its attention in timely-filed comments.” She decisively rejected the BLM’s attempt to exclude the expert declarations from the agency’s decision-making process and affirmed that the Court would consider the “material scientific evidence” contained in the declarations as in future rulings in the case. “The very essence of the wild horse, that is, what makes it a wild horse, is the social organization and social behaviors. Geldings (castrated male horses) no longer exhibit the natural behaviors of non-castrated stallions. We know this to be true from hundreds of years experience with gelded domestic horses. Furthermore, gelded stallions will not keep their bands together, which is an integral part of a viable herd. These social dynamics were molded by millions of years of evolution, and will be destroyed if the BLM returns castrated horses to the HMAs. . . . Castrating horses will effectively remove the biological and physiological controls that prompt these stallions to behave like wild horses. This will negatively impact the place of the horse in the social order of the band and the herd. The other declarations, submitted by Dr. Allen Rutberg of the Tufts University School of Veterinary Medicine; Dr. Anne Perkins of Carroll College in Montana; and Dr. Bruce Nock, a faculty member at Washington University School of Medicine provided further scientific information about the impacts of castration on wild stallions and wild horse herds. Other plaintiffs in the federal lawsuit challenging aspects of the Pancake roundup include wildlife ecologist Craig Downer and photographer Arla Ruggles, who enjoy wild horse viewing in the HMAs and whose professional and aesthetic interests will be harmed if the BLM moves forward with its plan. The plaintiffs are being represented by the Washington D.C. public interest law firm Meyer Glitzenstein & Crystal. A previous lawsuit filed in July 2011 by the firm prompted the BLM to withdraw a similar plan to release hundreds of castrated wild stallions in two HMAs in Wyoming. The complaint alleges that the BLM’s plan for the Pancake Complex violates the Wild Free Roaming Horses and Burros Act, the National Environmental Policy Act, and the Administrative Procedures Act. The complaint can be read here. The American Wild Horse Preservation Campaign (AWHPC) is a coalition of more than 45 horse advocacy, public interest, and conservation organizations dedicated to preserving the American wild horse in viable, free-roaming herds for generations to come, as part of our national heritage. The Cloud Foundation is a non-profit organization dedicated to the preservation and protection of wild horses and burros on our Western public lands with a focus on protecting Cloud’s herd in the Pryor Mountains of Montana. 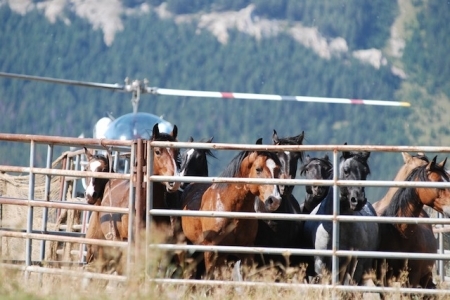 The Cloud Foundation (TCF) received a report from wild horse advocate, Lisa Friday, regarding the conditions of two Bureau of Land Management (BLM) wild horse holding facilities in Utah. Friday was following up on the wild horses she found living in squalor at the Herriman holding facility outside Salt Lake, who were relocated to other facilities in the state. Despite finding the horses living in clean pens with plenty of hay, Friday’s report contains stills and video which reveal more inhumane treatment of wild horses. In March of this year, Friday revealed wild horses living in knee-deep mud, manure and urine with no dry place to lie down at the Herriman facility. As a result of her video, released by TCF, and subsequent BLM reviews, the facility is closed for the winter with plans to close permanently within the next two years. Friday was not permitted to take pictures or video when she visited the Gunnison Correctional Facility on October 27th, however she reports seeing the same long, uncared for hooves and lameness. She even saw an inmate riding a lame mustang with severely long toes. 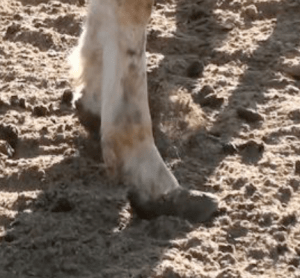 Friday took pictures of 20 or more captive wild horses in the Delta Facility with severely curled hooves and reported that the Gunnison facility had the same problems. Horses in the care of private citizens are often trimmed every 6-8 weeks. Hoof health is essential for horse health. Friday also discovered a bay mare (Neck tag #7081) in the Delta facility with a very severe-looking eye condition. The veterinarian for the facility did not know what had caused the problem. Eye problems in horses can cause blindness. Two weeks later, the condition has yet to be diagnosed or treated. Friday attended the Winter Ridge roundup near Vernal, Utah two months ago. She wanted to check in on those horses now in holding who were shipped to the Delta facility. She was shocked to see a lot of the wild horses were not freeze branded and did not have ID tags. In August, a trailer was busted at a port of entry outside of Helper, Utah under suspicious circumstances and 64 BLM mustangs bound for slaughter in Mexico were impounded.